Millions of people suffer with joint pain and arthritis. There are many different causes of joint pain and arthritis and, as such, there are many different strategies needed to address those varied causes. There will never be a solitary cure for arthritis because no one cure could ever address all the different causes of the disease. There are, however, ways to analyze your own body to discern what may be causing pain and inflammation in your personal case. In this episode, Tony, Will & Kinna highlight the most common causes of joint pain and arthritis. They point out the body chemistry imbalances that most frequently result in arthritis and also highlight the role of posture, movement patterns and bio-mechanics in the occurrence of joint pain and osteoarthritis. 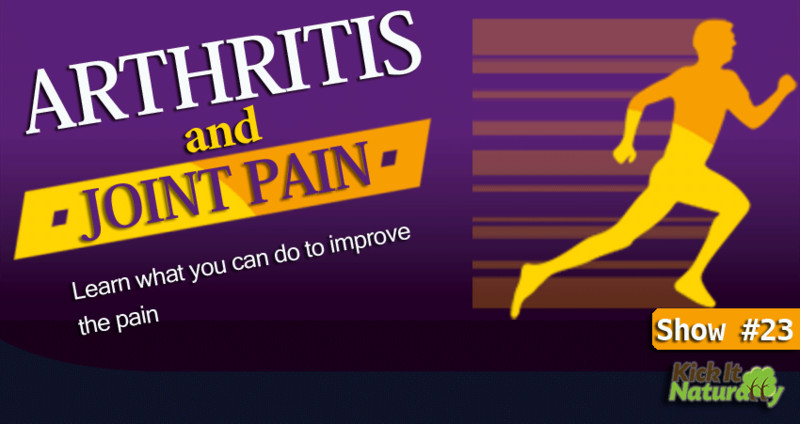 There are different types of arthritis and many different causes of arthritis and joint pain. An accelerated tissue breakdown state (a.k.a. The Catabolic Imbalance) is a common contributor to joint pain and arthritis symptoms. Other body chemistry imbalances that commonly contribute to arthritis symptoms include the Anabolic Imbalance, elevated blood lactate and errant calcium metabolism. Each of these are described at discussed at length in this episode. Posture and joint movement patterns (a.k.a. bio-mechanics) are also an extremely common cause of joint pain and locally occurring inflammation. Will mentions various book and video resources you can use to assess and correct your biomechanics. Kinna: Welcome to Kick it Naturally. I’m Kinna McInroe and I’m here with T.C. Hale, author, natural health expert, producer, blah, blah, blah, blah. It just goes on and on. Tony: Power to the people! Tony: I don’t know what that means. Kinna: When are you going to stop being things? Tony: Being things? Oh because I have too long of a list? Kinna: You got a long list there. Tony: Power to the people. That’s all I got. Kinna: He does a lot. Okay. And we’re here today and we’re also with Mr. Cutie Patootie, Will Schmidt. Hey, Will. Tony: Hello Cutie Patootie, Will Schmidt. Kinna: Will is sitting here with some tassels on. Tony: I thought that was weird. I didn’t want to say anything. Kinna: It’s like the newest and the coolest with all the cool kids in Hollywood. Will: It’s LA, everybody is doing it. Kinna: So if this is your first time hearing us you need to pull over and immediately like us on Facebook at Kick it in the Nuts. We’re going to post topics there every single week on future shows that we’ll be doing. Kinna: Sunday! You can ask questions there about whatever topic that we’re posting. And these guys will try to answer it. Tony: Yeah. Or we’ll just make up something that’s funny. And as long as it’s funny then it’s okay if we’re wrong. Kinna: Alright. For all of our Kick It Naturally listeners Audible is offering a free audio book download with a free 30 day trial so you can check out their service. Just go to KickItInTheNuts.com/audiobook to find the link. Tony: And that’s, that’s for all the listeners. Not even, the annoying ones get it too. Kinna: So today’s topic of choice is arthritis or joint pain. And we had a lot of people who were asking questions about this. There’s a lot of people out there hurting. What’s going on?